Nikko Asset Management Co., Ltd. (“Nikko AM”), as an asset management company, acts as a fiduciary on behalf of its clients and is firmly committed to putting its clients’ best interest first. It places fiduciary and ESG principles at the highest guiding theme of its corporate value and actions. Nikko AM strongly believes that investments by considering environmental, social and governance (“ESG”) are inherent to long-term corporate value creation, and contribute to the realization of sustainable economic growth. As such, Nikko AM views ESG issues as an integral part of its fiduciary duty and endeavors to incorporate ESG principles in all its investment processes. Nikko AM, for the realization of high-quality financial services that truly meet clients’ needs, always endeavors to act in the spirit of the fiduciary and ESG principles, and continually makes effort toward further improvement with the ideas of innovation. Fiduciary principles are at the heart of Nikko AM’s asset management business, and the highest guiding theme behind Nikko AM’s management philosophy for maximizing investor interests. Preparing documents for customers and providing explanations to investors, with emphasis on easy-to-understand investment policies, product risk characteristics and fee transparency, etc. Ensuring strict screening processes that reflect changes, etc. in relevant domestic and international laws, regulations and market environments, etc. 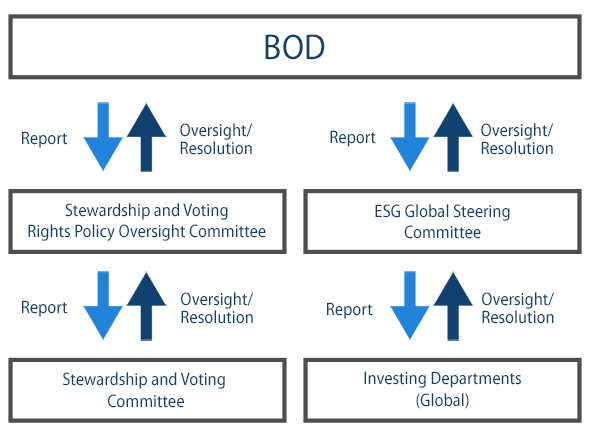 Fiduciary & ESG Principles are Nikko AM's highest guiding themes as an asset management company, and resolutions, reports, deliberations relating to them are all carried out at meetings of the Board of Directors.